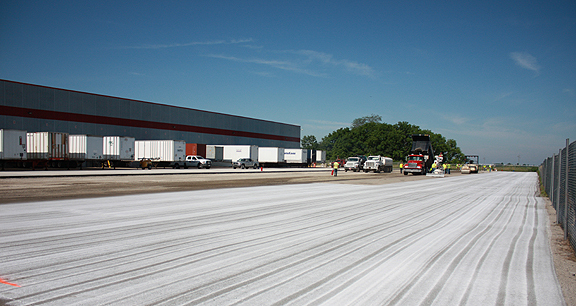 Project obstacles and solutions: Purity Wholesale Foods had an asphalt paved parking lot/staging area for their loading docks at their warehouse in Lebanon, Indiana. They desired a more durable and maintenance free paving solution. They contracted with E&B Paving to remove the asphalt and replace it with imix Roller Pave - a roller compacted concrete pavement (RCCP). RCCP has been used in industrial settings because it has the strength to handle very heavy loads and, because it is so dense, it is able to resist the impact of freeze and thaw cycles that will damage conventional paving methods. In twenty year studies, it has proven to need virtually no maintenance. Purity Foods wanted to improve the longevity of their docks and staging areas, but they also needed to keep their warehouse operational during this time. They needed to use the newly paved areas within 48 hours of placement. E&B Paving removed the old asphalt. IMI supplied 1,100 yards of imix Roller Pave to E&B for Phase I of the project. The mix had to be engineered to achieve strength before the 48 hour deadline. RCCP is a very dry, zero slump concrete. It is delivered by tri-axle dump truck rather than mixer truck to compensate for the very dry nature of the concrete mix. IMI QC/QA tested the concrete throughout the paving process to maintain proper consistency from one load to the next. White pigment curing compound was applied to the surface of the pavement to ensure the concrete would cure and gain strength within the parameters the customer had specified. The last of Phase I of the project was paved on Friday, June 14, 2013. Within 24 hours, light truck traffic was driving on the pavement. The dock was operational with heavy traffic on Sunday morning, June 16. For more information on imix Roller Pave, click here.